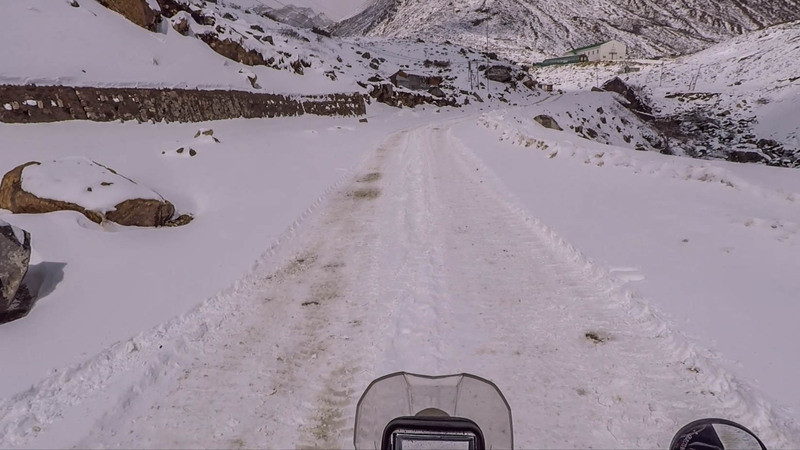 As we rode higher up to the Gurudongmar and Tso Lhamo lakes in North Sikkim, we found that the Army trucks had done a fine job compacting the snow into a thick layer of ice. Our knobbies had a tough time breaking into the ice and our tyres started slipping all over the place. I wasn’t too concerned about my rear tyre. It had been swinging like a pendulum from the start. All I had to do was point the front tyre in the direction I wanted to go and keep the throttle at a steady position. Any sudden burst of power would swing the rear tyre a little too much and would most likely result in me losing the rear. Our knobbies were helping us get the traction we needed. But they would work only as long as we regulated the power to the rear wheel. But now with the tracks converted into unbreakable sheets of ice, the front tyre started slipping as well. After a couple of close calls I decided that it was time to try the middle section between the tracks. It did the trick, but at a cost. The middle section is where the stones and rocks tend to gather. The snow did a good job hiding them and so I had to keep a strong hold of the handlebar at all times. In an adventure you often need to figure things out as you go. Its the excitement of not knowing what will happen next that makes the experience all the more interesting.